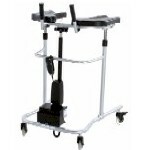 The Eva® Pneumatic Support Walker supports the patient's weight when mobile or exercising. This walker is particularly well suited for Post-op patients when early walking exercises are indicated and there is a concern for possibilities of a fall. EVA Adult Support Walker is available in two sizes: Home style and Institution style. The Home style measures 28 inches wide at the base to easily fit through doorways and narrow hallways. The Institution style measures 31 1/2 inches wide at the base to provide a wider entrance for wheelchair use. 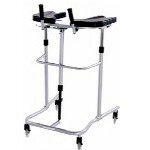 The EVA Support Walker also comes in two models: Standard or with Directional Casters. The Standard Eva Walker has step on caster locks on the rear wheels. All four wheels swivel 360 degrees. Eva Support Pneumatic is adjustable for height and width with an easy to release lever mechanism. 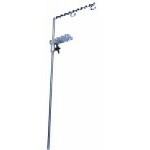 The height is adjustable from 35 inches to 47.5 inches. The width can be adjusted from 12 inches to 20 inches. This adjustability provides flexibility for the use of the EVA for one or more individuals in a rehabilitation facility. The padded, ergonomically molded arm-pads have a sculpted forearm cutout to keep the arms from sliding off the pads. They are removable and can easily be cleaned and sanitized making it ideal for institutions with a variety of users. 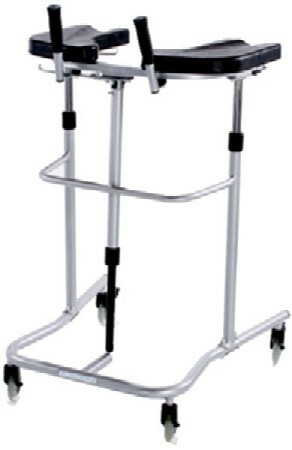 The EVA Pneumatic Support Walker is constructed of a welded steel frame with baked epoxy enamel finish. 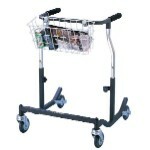 The non-marring casters are equipped with step on wheel locks on the rear casters. Handgrips are a more comfortable round shape and are forward facing, providing a better and more ergonomic grip. These ergonomically designed Handgrips are now a standard feature on the Eva Pneumatic Support Walker. o Height adjustable from 35" to 47.5"
o Height adjusts from 35"-47.5"
o Inside base width (rear) is 23.25"
o Base length is 27"
o Inside arm width adjusts from 12-20"
o Length of adjustable padded arm is 17 1/2", and 6 1/2" wide. Click on the "more pictures" buttom above (under image) to view optional accessories and other views of the walker. The IV Pole for EVA Support Walkers attaches to the walker with a metal bracket. The bracket is attached under and on the side of the walker's support frame. 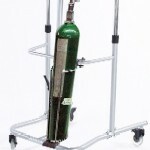 The EVA Support Walker Portable Oxygen Tank Holder for either D or E models of O2 tanks. Wenzelite bariatric sized safety rollers are height and width adjustable with swivelling non-marring wheels for inside or out. Electric version of the EVA Pneumatic Support Walker. Supporting your forearms this walker will help lift you from a sitting position. 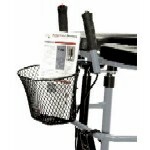 Promotes standing and walking in an upright position without needing to bend to reach the handlebars.